When shopping for clothing online it is more important than ever to know your true size. It is frustrating to take the time to select and order clothing only to receive the merchandise and it doesn't fit. Knowing exactly what size you should order can make all the difference in the world between a shopping success and a shopping disaster. Most sites will help you determine which size you should order by providing a sizing chart. Below is an example of what to look for. Individual websites may differ slightly so be sure to check each before ordering. If you are between sizes it is best to order the larger size to guarantee a fit. You will need a measuring tape. If you don't have one of these they are available in the sewing department of large stores such as Wal-Mart or Target. Sometimes even the grocery store will have a small notions department and I have seem them there as well. If you prefer to shop online tape measures are available at Jo-Ann Fabric & Crafts . Standard 60" tape measures are not always long enough. Extra long tapes are harder to find locally. Both the standard 60" tape and the extra long 120" tape is available online at Jo-Ann.com. Three commonly given measurements on size charts are bust (or chest for men), waist and hips. 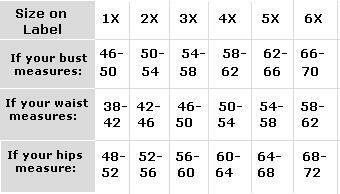 To measure the bust or chest: With undergarments on and clothes off measure under the arms around the fullest part of the bust or chest. Keep the tape straight across your back. Keep the tape somewhat snug, but still comfortably loose. To measure the waist: While in a relaxed position, measure around the narrowest part of your natural waist. To measure the hips: Stand with your legs and feet together and measure around the fullest part of your hips. To measure the inseam: Measure from the crotch point to your ankle bone. Or using a pair of your pants that fit you well, lay them flat with the front and back creases together. Measure from crotch seam to bottom of the leg hem along the inside seam. To measure sleeves: Bend the elbow and measure from the center of the back of the neck to the elbow and down to the wrist. Measuring for a bra requires two measurements. One for the band size and another for the cup size. To find the band size of your bra first measure all the way around your body directly under your bust (where the band of the bra will sit when worn). Round to the nearest inch. Next, to find the cup size of your bra measure around your bust at the largest point. Make sure the tape is just touching and not binding. It is the difference between your first measurement and the second that will determine your cup size. Subtract measurement #1 from measurement #2. How many inches difference do you get? Now compare to the chart below to determine your cup size. If further information is needed for fitting your bra please refer to this website where you will find an abundance of relevant information.